Property consultants, CBRE have today released their latest half yearly research report on Global Prime Retail Rents. The report shows that Dublin was one of the EMEA cities to experience a higher than average increase in high street retail rents in the year to the end of first quarter 2017, up 10.5% in the period. The report which is based on the retail rent per square foot that retailers have to pay every year to occupy a shop in a prime location shows that Europe was the only region to register rental growth in the first quarter 2017 with an increase of 4.3% year-on-year. Dublin was ranked fifth in the top 10 fastest growing retail locations, according to the report. 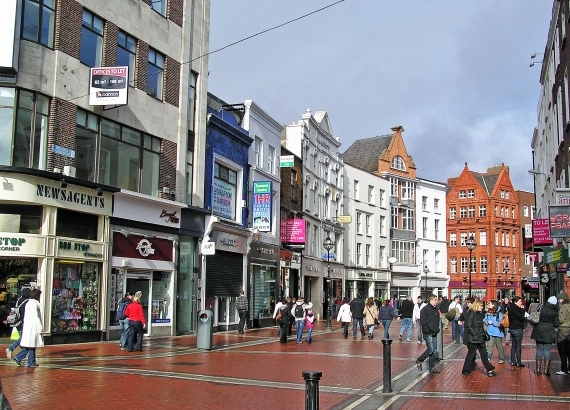 Demand for prime high streets such as Grafton Street and Henry Street is not limited to occupiers alone with strong investor demand for any high street investments that are offered for sale. Since 2013, there has been close to €442 million of investment transactions on Grafton & Henry Street. The largest proportion of these occurred in 2015 when assets such as Sovereign Portfolio traded. This portfolio was acquired by Irish Life for €154.8 million. Irish institutions have been the most dominant buyers of prime high street assets acquiring 62% of Grafton & Henry Street assets since 2013. In recent weeks, CBRE have been involved in the sale to an Irish institution of 100-101 Grafton Street, a unit let to AIB bank for a price reported to be in excess of €50 million and have also been involved in the sale of 17 Mary Street to State Street. Natalie Brennan, Senior Director in the investment team at CBRE in Dublin partly attributing the strong appetite demonstrated for both of these assets to their long-term rental growth potential. Senior Director in CBRE Ireland’s retail team, Bernadine Hogan said, "Demand for quality retail space in Dublin remains robust and the arrival of brands such as Victoria’s Secret and & All Other Stories onto Grafton Street has further underlined the importance of these prime shopping destinations. We expect to see some further upward pressure on Prime Zone A rents on streets such as Grafton Street over the coming months. The retail sector is rapidly evolving and is a highly competitive market, therefore, retail brands must focus on targeting consumers across multiple channels. She added, "The physical store remains an important part of the consumer journey and retailers will continue to target prime bricks-and-mortar locations to grow their brand. Stores will also become the place that customers use to interact with physical products and retailers will use to showcase and try innovative technology." The top five markets for prime retail rents were London, New York, Hong Kong, Paris and Tokyo.